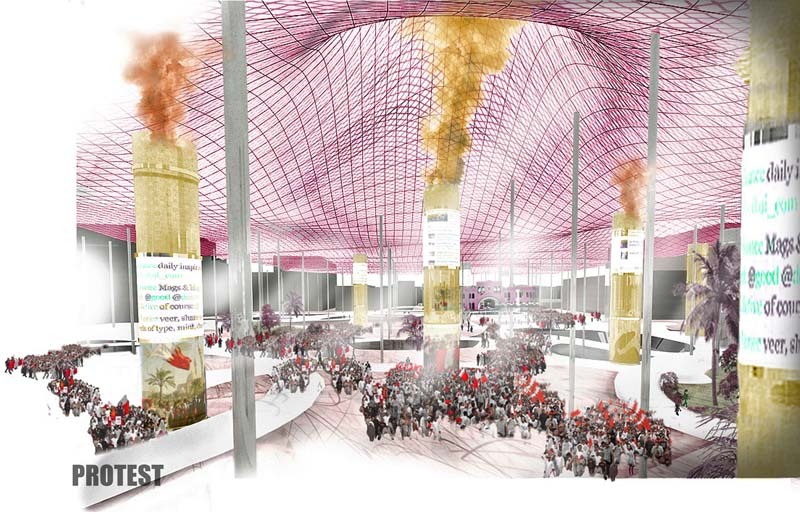 Below is our complete entry for the BAB Al Bahrain Competition. 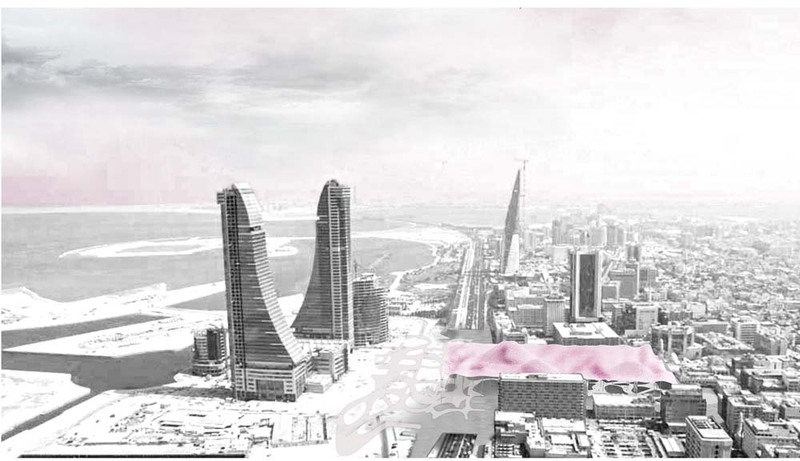 The competition was seeking new urban design ideas for BAB square in Bahrain's downtown center, turning it into a viable urban square and taking into consideration the new changes in lifestyles and behaviorism in the Arab World. As countries and societies are constantly (re)identifying their historical and cultural resources, architects are being more often involved into design interventions that are based on careful studies of complexity of the existing contexts, both spatial, cultural and environmental. Bab Al Bahrain (BAB) building and its surrounding square are interwoven in the diversity of interrelations that are produced by the two historical faces of Bahrain. On one hand there is the building itself, comfortably situated in the capital’s old quarters, thus standing as a silent souvenir of Bahrain’s rich history; on the other hand, countless numbers of glazed high-rise towers, gated luxury developments sitting on reclaimed land, all embody Bahrain’s modern history and its ultimate quest for modernity. 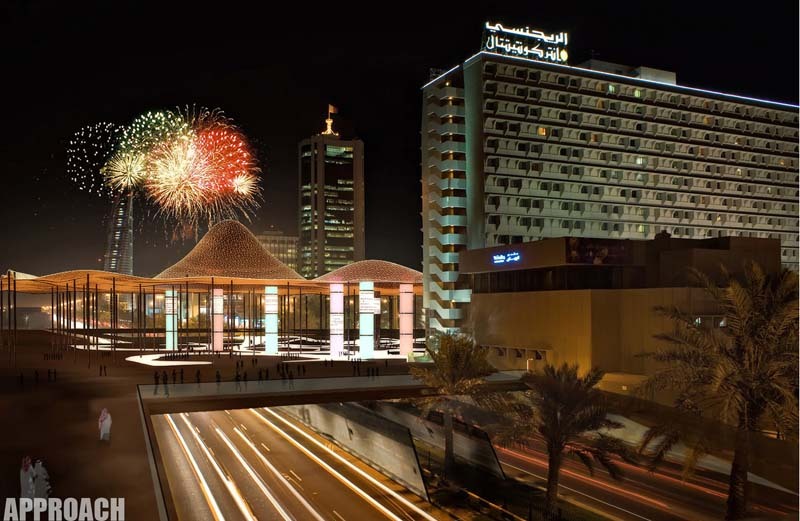 The proposal aims to activate the square as a vibrant city center, symbolizing Bahrain’s history, heritage and modernity collectively, and to allow it to act as an integral part of everyday urban life. This unique sense of place is achieved by attracting the public of all ages, improving communication and social exchange amongst the users, and by creating a flexible multi-use space able to host numerous cultural and social activities and events. Besides the permanent activities located in the new BAB square, it will also be a place for continuous temporary events and exhibitions, and shall remain in a state of constant flux and transformation not only programmatically, but also spatially. It will be a space that is responsive to its changing setting, manipulating the way in which it is perceived and interacted with. It will be a space that is in continuous dialogue and exchange with Bahrain, its history, its citizens, and its social, cultural, and political happenings. 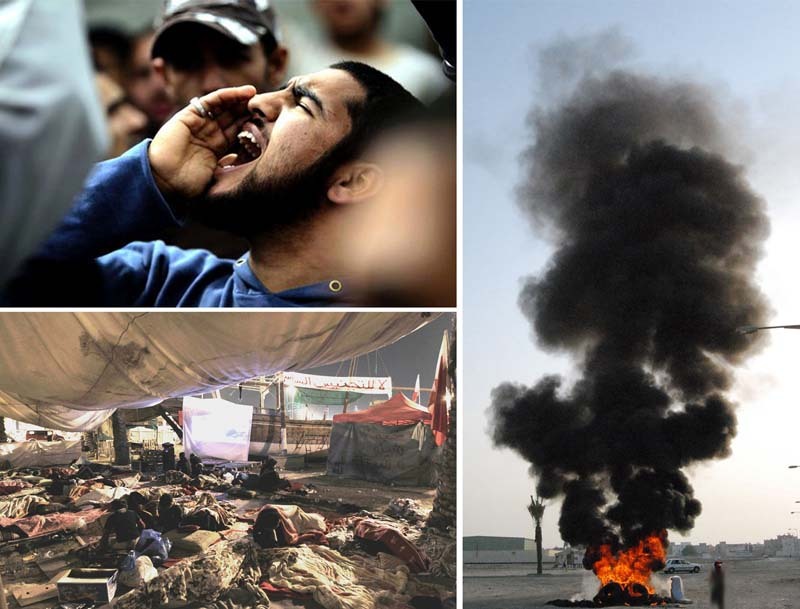 Public space has been a major player and central constituent of political protests and uprisings in the arab spring. It is growingly being considered a space for congregation and meeting, political discussions, and even decision-making. 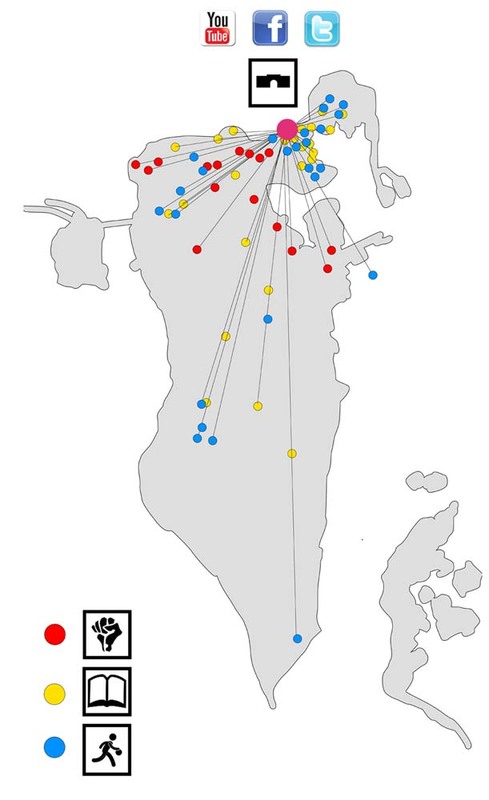 On the other hand, Bahrain’s political protesting (post-lulu square demolition) remains largely nomadic and changeable, moving and mutating quickly, heavily dependent on real-time information transfer. Social networking and smart phone real-time information transfer also endorsed the arab spring and provided an answer to the complex situation of continuous fluctuations. 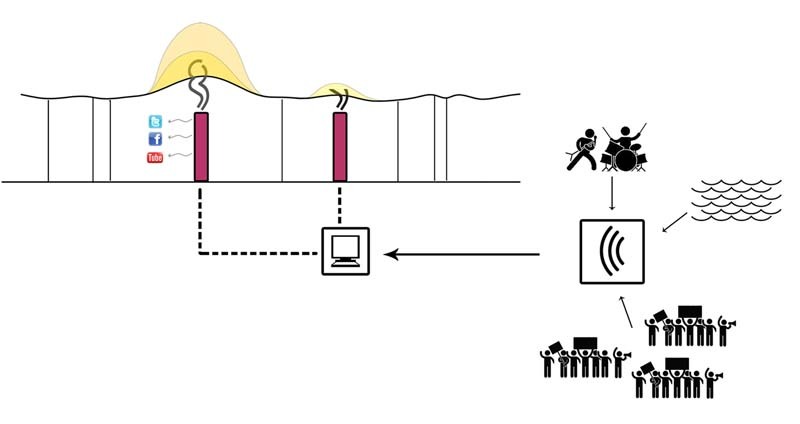 The strength embedded in the internet, social networking, and geo-tagging as new uncontrolled collective space; propose new possibilities and understandings of cities and urban situations based on interaction, responsiveness and continuous change. 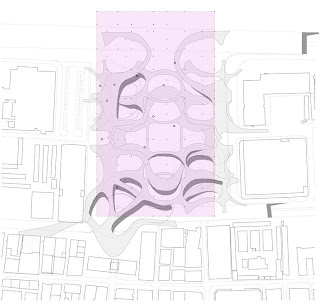 At the center of our proposition was the interest in spaces which make invisible processes visible. 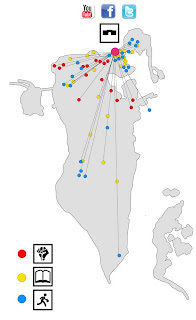 We’ve established a logistical communication network between the square and other locations in Bahrain, through sound input nodes dispersed in major political (protest), cultural and recreational locations, as well as in several seafront locations. Sound inputs (frequency, volume..etc.) are translated into hot air/smoke streams emitting from 11 giant pillars in the square, inducing the movement of a thin fabric hanging canopy by utilizing air buoyancy and pressure. Projections of social media feeds, real-time streaming coverage of events are displayed on the pillars accentuating a parallel atmosphere in the square. As events and happenings develop, mutate, move, the square responds accordingly in different ways, turning far invisible activities into visible signals, linking remote locations and happenings together and bringing Bahrain into its square. In its politically ‘quiet’ scenario, the canopy is stimulated by sea sound inputs surrounding the island, as well as a number of preset scenarios. It moves and ripples seamlessly providing a continuously changing atmosphere and displaying on its screens updates and feeds from major cultural and recreational events/news. 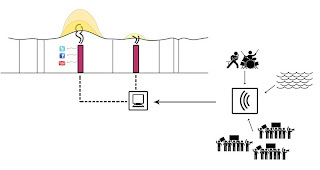 The project proposes a solution where traffic is re-routed, generating a significant urban territory where the car traffic is prohibited and pedestrian activity promoted. The new traffic plan is achieved by adding to two underground car tunnels for King Faisal Highway (KFH) and Government Avenue. 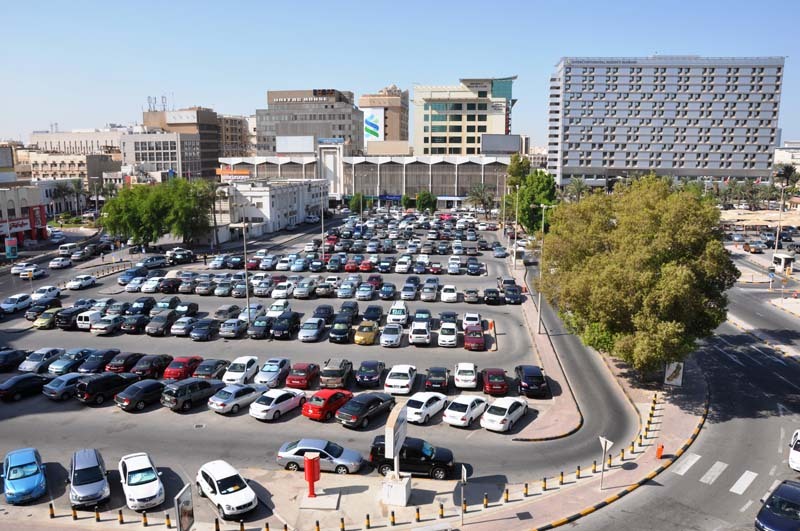 The existing parking for the Souq district is moved underground divided on two floors and can be accessed through these tunnels, while the existing BAB fountain, cul de sac, and drop off zone are moved one floor below ground. This allows a new pedestrian connection linking the Bab building to the square and ultimately to the kornishe and sea, where further recreational activities occur. Access to the Regency parking is maintained via a one-way road looping back to the KFH, and another similar one-way road on the other side of the square connects the Gov. Avenue and the KFH. In this perspective these two tunnels provide a new all-pedestrian experience, connecting the city center and BAB to the sea, and continue the traffic flow to and from the central district and the square. 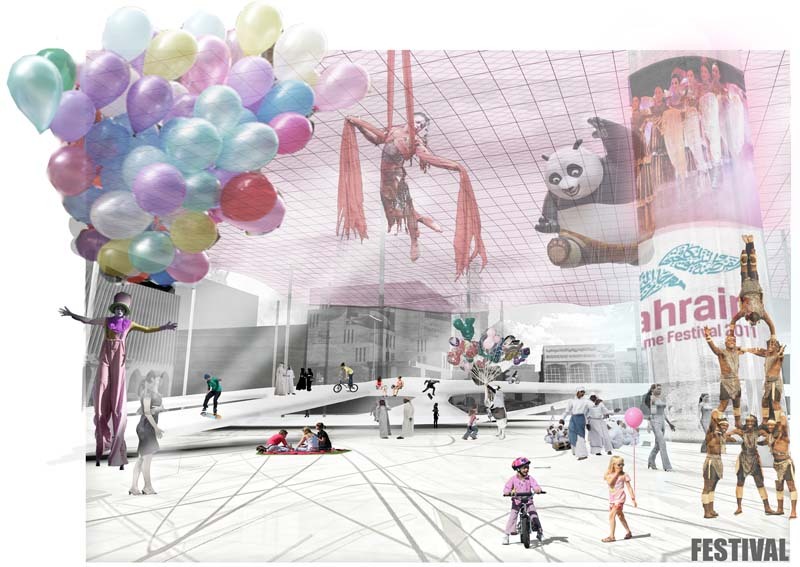 This ‘pedestrianization’ of the square will provide a vibrant commercial, cultural and recreational pedestrian node that will accommodate numerous activities and allow for different permanent and temporary festivities. 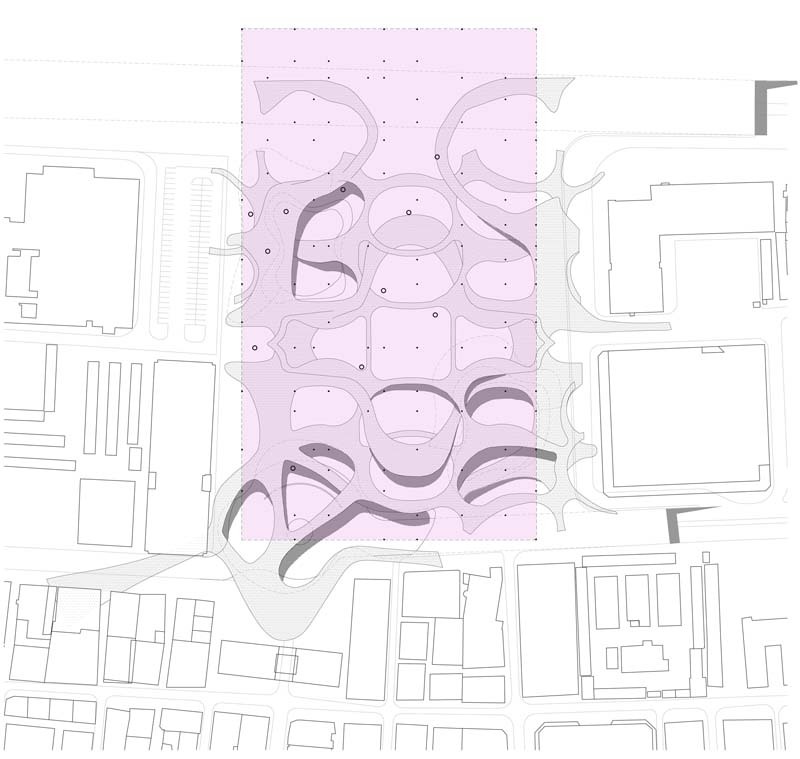 On the ground floor level, the project proposes a topography of continuously unfolding, undulating surfaces enclosing a sequence of spaces. This ground ‘topography’ of interweaving pathways of varying widths, not only acts as a network of circulation elements, but also contributes significantly to the character of the space. The delicate undulation maximizes the sense of anticipation as one walks through the site. Furthermore, it provides functional and programmatic possibilities with its sloping surfaces, and creates enclosures for both intimate and larger gatherings. These include day market, vending , art exhibitions and installations, music concerts, carnivals, religious festivals and movie screenings as well as protesting, meeting friends, relaxing, biking and skating. The existing post office building is moved to the upper underground level, accessed through a large planted courtyard that provides fresh air and exceptional views. Two additional buildings, the National Archives and the Children's Museum, are located also in the upper underground level and are accessed directly from another courtyard that acts as a unique entrance plaza. 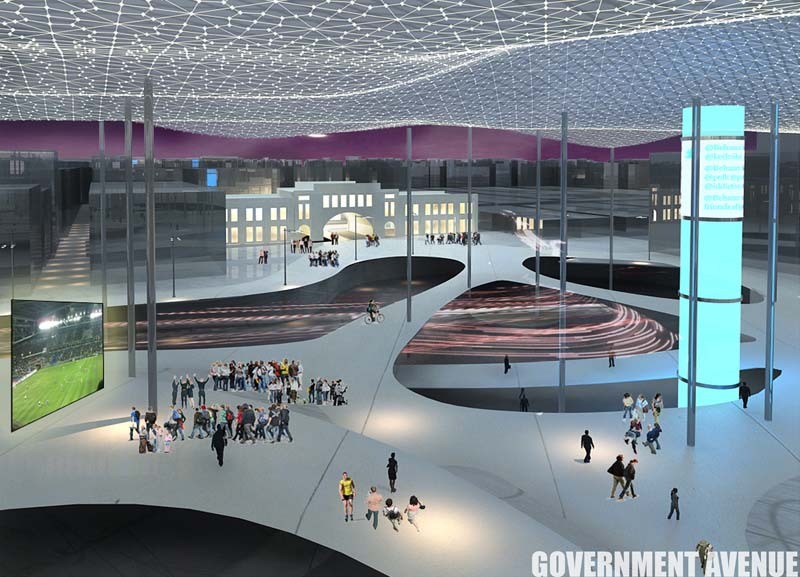 With the proposed buildings, additional cultural possibilities emerge to turn the square into a cultural hub for Bahrain such as a traditional music museum and recording studios. While the 30m high fabric canopy provides comfortably shaded areas for the square plaza, the proposal achieves several additional spatial qualities by utilizing a number of landscaping strategies. Dense planting is used between the square and adjacent roads to provide enclosure and visual separation from vehicular traffic. Underneath the canopy groups of palm trees are used to identify green areas which punctuate the space and provide grass surfaces for flexible activity and event uses. The ground floor design of undulating wrapping surfaces provide elements that support constant activities, such as seats, toilets, bicycle racks, trash bins and water fountains.